Who hasn’t repeated that iconic line from Billy Crystal’s character “Fernanado” during his stint on Saturday Night Live 1984-85? Billy Crystal turned 65 on March 14, 2013. He has been an entertainer and comedian since the day he was born. Now he entertains us once again with his recently published memoir, Still Foolin’ ‘Em. I highly recommend this book to anyone who’s enjoyed Billy at any stage in his career. Billy’s early audience consisted of his close-knit Long Island Jewish family, headed by his father who was a jazz concert promoter and managed the Commodore Music Shop in New York City. Extended family gatherings were the perfect venue for young Billy to figure out he enjoyed the limelight and was a “natural” at entertaining a crowd. “Growing up Crystal”, as Billy describes it, meant immersion in jazz music at his Dad’s record store; hours listening to comedy records his Dad brought home; and summertime explorations of the surrounding beaches, boardwalks and waterways with his childhood buddies. 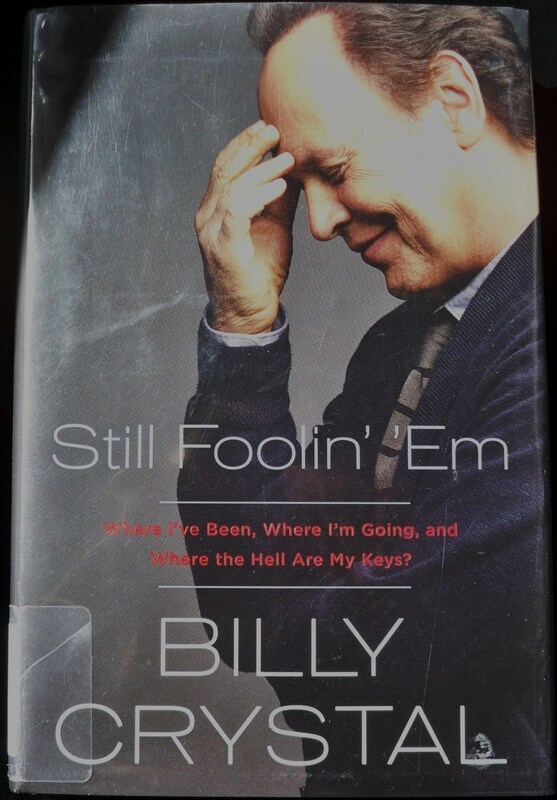 As expected, the book chronicles Billy’s rise to stardom: his grueling late nights in comedy and nightclubs, his Saturday Night Live stint, his successful movie career, and his reign as host of the Academy Awards. While he writes of the woes and ironies of aging with the bawdy humor you’d expect, it is his passion for his family, his late father and the New York Yankees that makes this memoir so compelling. I will leave it to you, dear reader, to learn more about Billy’s lifelong love affair with the Yankees, his early musical adventures in the company of New York’s jazz greats, his long and happy marriage to Janice, his relationship with his beloved daughters and grandchildren, and his enduring friendship with Muhammed Ali. When Billy was only 15, he lost his father unexpectedly, a loss that deeply affected Billy. Because his father worked six days a week, Sunday was the only day Billy was able to spend with him. Billy calculated they had exactly 700 Sundays together. In 2013, in a loving tribute to his father, Billy wrote and acted in his one-man, Tony-winning, Broadway production called “700 Sundays”. It aired recently on HBO; if you have a chance to see it, do! Lions, Tigers and Tangles – Oh My! He’s so great is Billy Crystal. Thanks Sammy D and for the clips! Thank you, Susan, for visiting! He is one of our comedic treasures! Do you remember “Soap”? That’s where I first “met” Billy Crystal. Thanks for the review – I’ll have to put this on my “To Read” list! I do not remember ‘Soap’ altho he talks about it in the book. His early years were grueling -i wondered how he and his wife made it through them! Both Hub and I loved his book – chuckling and crying. Here’s an ad for the show from YouTube – Billy is up first. I’ve never actually been a huge Billy Crystal fan, though I do love some of his films, including When Harry Met Sally. Loved the clip. The thing that got me about this was his 700 days with his dad, which brought tears to my eyes and inspired me to calculate how many weekends I spent with mine after my parents’ divorce. I got 180. Not enough. You are right, Melinda, you didn’t have nearly enough. Divorce is so difficult even under the best circumstances. I hope you might be able to think about some of those 180 and what you shared with him. I think I will try some writing exercises about my time with Dad. I haven’t heard of “700 Sundays” before, but it sounds quite moving. I met Billy Crystal once back when he was filming “City Slickers” but it wasn’t a good day for him and sadly, he kind of took that out on everyone, including the people who were trying to help 😦 However, I have always enjoyed his films. Ooh I’ve heard stories of other celebrities who took it out on pilots amd flight attendants. Sorry your personal encounter soured. Perhaps, like many of us as we age, he’s mellowed and would choose to behave differently if he had a do over. He did make mahvelous movies. I love Billy Crystal. His Oscar hosting gig was hilarious — some years back. A classy, funny act. Thanks for the clip, Sammy. You bet! He has had a “good run” for sure! Great review! There are so many characters that Billy created that I’ve enjoyed. I really liked him in Running Scared with Gregory Hines. Fun stuff!